If you could go back in life and get a do-over, would you take that chance and change the course of history? 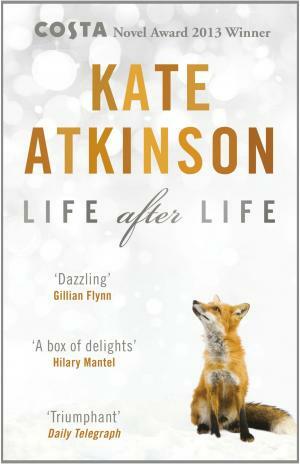 Kate Atkinson’s brilliant novel, Life After Life tackles this intriguing question. Ursula Beresford Todd, human palimpsest, gets the chance to live life after life, each time altering the future based on the sometimes not so fun events of the past. Life After Life reminded me of how the superposition principle of quantum physics plays out in Ruth Ozeki’s marvelous book, A Tale for the Time Being. Ursula’s life path has a bevy of possibilities — the array that collapses as you, the observer, follow her story. I don’t want to say much about the plot to avoid spoilers, though Life After Life is everything I feel a great book should be. It’s a period piece, set in 20th century Europe. The characters are exceptionally deep, fully-flawed, and interesting. I loved that you get to see and experience each vivid character from many different viewpoints — their best and worst sides included — which makes for terrific, rich reading. You’re never quite sure where Atkinson is going to take you via Ursula and you’re on tenterhooks until the very last page wondering how this imaginative book will end. Should you read this book? In the words of Ursula’s mom Sylvie, needs must (necessity compels). Special thanks to my friend Michelle for putting this book, and its sequel, A God in Ruins on my reading radar. The cat and the atom represent two entangled particles. Entangled means that they share certain characteristics or behaviors, in this case their fate within the box: decayed atom = dead cat; and undecayed atom = live cat. The two behave as one. Imagine that instead of an entangled atom/cat in the box, you were measuring a single electron. Before you open the box to observe it, that electron exists as a wave function, which is an array of itself in all of the places it might possibly be in the box. This quantum phenomenon is called superposition: that a particle can be in all of its possible states at once. The measurement problem arises the moment you open the box to observe the particle. When you do, the wave function appears to collapse into a single state, fixed in time and space. Due to the quantum principles of entanglement and superposition, until you observe it, the cat must be both dead and alive, at the same time. But the questions his thought experiment poses are interesting: At what point in time does a quantum system stop being a superposition of all possible states and become a singular, either/or state instead? And, by extension, does the existence of a singular cat, either dead or alive, require an external observer, i.e., you? And if not you, then who? Can the cat be an observer of itself? And without an external observer, do we all just exist in an array of all possible states at once? The many-worlds interpretation, proposed by the American physicist Hugh Everett in 1957, challenges this theory of wave function collapse, positing instead that the superposed quantum system persists and branches. At every juncture—in every Zen moment when possibilities arise—a schism occurs, worlds branch, and multiplicity ensues. Every instance of either/or is replaced by an and. And an and, and an and, and an and, and another and . . . adding up to an infinitely all-inclusive, and yet mutually unknowable, web of many worlds.